You’re viewing the webpage for Makeover Montgomery 3, which was held in 2016. Makeover Montgomery 4 happened in May 2018. Get more information on the most recent conference. Thank you to everyone who participated in MM3! We are currently processing narrated slideshows for each session, which will be posted online ASAP. The conference sessions will begin on Thursday, May 5 at the Silver Spring Civic Building (One Veterans Plaza, Silver Spring, MD) and continue on Friday, May 6 at the same location. Setting the stage for the sessions will be plenary speaker, Stefanos Polyzoides of the Pasadena, California-based firm Moule and Polyzoides. A founder of the Congress for the New Urbanism, this architect and urbanist has been at the forefront of the anti-sprawl movement in advocating for compact, mixed-use and walkable suburbs. Over the past three decades, Polyzoides and his wife Elizabeth Moule have designed civic buildings, historic preservation and commercial projects, housing and campus and urban plans. As advocates for sustainable development, they have produced a variety of exemplary green buildings for university and institutional clients. Polyzoides is a professor emeritus of architecture at the University of Southern California and has been a visiting professor at several leading architecture schools. He is the author of several books, including Los Angeles Courtyard Housing: A Typological Analysis. Adam Ducker joined RCLCO in the mid-1990s as an associate directly after graduate school, and learned the trade with the firm. He is a recognized expert in economic development, market and financial analysis; positioning, repositioning, and marketing of real estate assets; consumer research; and corporate strategy development. He has particular depth of expertise in high-density housing, retail/entertainment, and hotel development. He also focused on the interrelation of transit and land use, and transit-oriented development opportunities. Adam currently heads RCLCO’s Urban Real Estate Advisory Group. The Urban Real Estate Advisory Group is distinguished by sophistication in forecasting housing, retail/commercial, and hospitality demand in revitalizing cities, suburbs and development corridors. The Group’s unique value add is an understanding of the unique set of circumstances that create vibrant mixed-use environments including transit-oriented development, and in the financing mechanisms and public-private partnerships that are relied upon to achieve them. Wes Guckert founded The Traffic Group in 1985. He is an expert in traffic engineering and transportation planning – a technical adviser in traffic analysis, traffic signal design, traffic circulation, access studies, automated and robotic parking systems, and transit planning. Since founding TTG, Wes has played a major role in more than 7,000 projects; directing the design and implementation of traffic access systems throughout the United States and internationally, from Canada, Mexico, and the Bahamas, to Indonesia, Dubai, South Africa, Turkey, Saudi Arabia, and China. He often serves as an expert witness, testifying before County and Municipal Boards, Local and Federal District Courts, and Planning Commissions on traffic engineering and transportation planning issues. Wes currently serves as Chairman for Urban Land Institute’s (ULI) Public Development Infrastructure Council (PDIC). He is also frequently asked to speak, judge, or provide commentary at top industry conferences, award programs, talk radio, and in trade journals. Transforming communities without transit into walkable, better connected places. Promoting multi-modal, “complete” street designs. Developing land use strategies to promote pedestrian-friendly, mixed-use districts. Creating thriving communities all around metropolitan areas. Facilitating co-housing to provide affordable housing and housing for seniors. Establishing community gardens and urban/suburban agriculture in public spaces. Using ride-sharing and Uber to solve transportation challenges. Co-locating public facilities to share resources and amenities. Striking the balance between redevelopment and displacement. Determining how the physical environment affects social and economic well-being. Weighing the effects of new development on schools and infrastructure. Achieving affordable housing in gentrifying areas. Maintaining locally owned and community centered businesses. Questions? Contact Jason Sartori at jason@ipcllc.net. Be part of the solution! Join sustainable growth experts at Makeover Montgomery 3 on May 4-6, 2016. 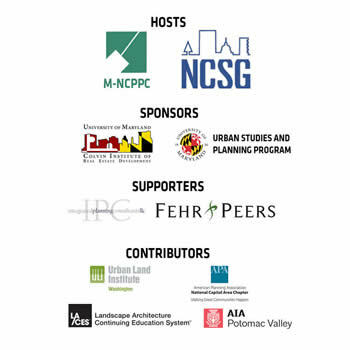 Note that the MM3 keynote address on Wednesday, May 4th will be held in the Auditorium at the School of Architecture, Planning and Preservation at the University of Maryland in College Park, MD. It will also be webcast live from http://smartgrowth.umd.edu. Events on Thursday and Friday, May 5th and 6th will be held in the Silver Spring Civic Building located at One Veterans Place in Silver Spring, MD. Directions and information on local hotels can be found here. AICP CM, AIA CE and LA CES credits have been approved for all sessions!